“I never thought I would know anyone from Microsoft,” said Desjonae Hixon, who spoke at Opportunity Summit 2018: Initiate alongside Carmen Summers, the Southwest Region Technical Sales Director for Microsoft Public Cloud. The panel brought together youth who shared their personal experiences alongside a leader who has helped create systemic change that impacts young adults. Now a full-time student at San Diego City College, Hixon talked about growing up with an uncertain future. Raised in San Diego by her father and aunts (one of whom Hixon affectionately calls “Aunty Mama”), Hixon’s family moved around the county a lot when she was younger. She attended three high schools, at one point commuting two hours each way on the trolley and city bus to get to school before moving in with friends who lived close by. Hixon has lived with friends on and off since middle school. “I’m grateful my friends’ families took me in, but living with friends is really hard,” said Hixon, who participated in sports like volleyball, gymnastics and soccer as a way to not spend too much time at home. She also did theatre, show choir and the ROTC, which taught her many essential, or soft skills. Hixon’s father was in and out of the justice system, having been involved with gangs since age 15. Now 46, he lives in Yuma, Arizona. 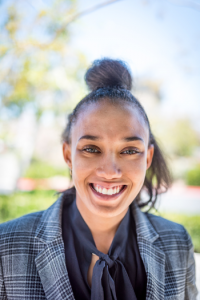 The first in her family to attend college, Hixon is pursuing an associate degree in fine arts with a minor in child development while also working part-time as a caregiver for multiple clients throughout San Diego. She hopes to one day become a teacher focusing on arts education. Hixon’s own interest in digital media and design led her to transfer to City College from another community college. She praises the campus’ focus on the arts, including a gallery where students can sell their work. Through the director of the Center for Applied Competitive Technologies on campus, she learned about TechHire, a nationwide movement that aims to level the tech playing field by pairing job seekers from underrepresented backgrounds in tech with jobs in computer programming, IT, analytics, robotics and multimedia and design. TechHire connected Hixon to an internship opportunity with Maresa Friedman, founder of The Executive Cat Herder, a firm that offers services in social media, marketing, strategy and operations. The 150-hour internship, which is coming to a close, has taught Hixon not only online tools like Wix, Canva and email marketing, it has taught her about problem-solving and multiple approaches to a problem. A visual learner, Hixon is learning a lot faster by doing rather than by reading a book. Just as important, if not more so, is the opportunity for Hixon to work for a business owner who happens to be a woman. Thinking about what could help reduce the number of opportunity youth (young adults ages 16–24 not in school or working) in San Diego County, Hixon talks about the importance of internships, like her own.